I am an avid book reader. When I am not reading fiction, my bent takes me back to my university days where I studied Psychology and Drug Abuse. I love anything to do with people, how they live, what they think and more than anything, experiences that are out of the ordinary. This could include biographies or books with a focus on different cultures, learning disabilities or medical challenges. My first real ventures into this area were a series of books by Neurologist Oliver Sacks (best known is probably The Man Who Mistook His Wife For a Hat) as well as a 2 books by Donna Williams - a high functioning autistic - on her incredible journey (Nobody Nowhere and Somebody Somewhere). 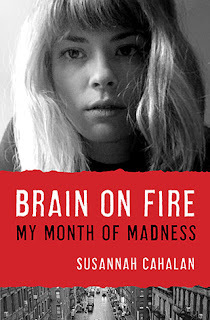 When I recently was perusing titles online at Chapters, I noticed a book by New York Post journalist Susannah Cahalan titled, "Brain on Fire - My Month of Madness." This one called me. Here was a bright, intelligent and focused professional that lost a month of her life - in fact could have lost her life - to a medical condition that had only recently been discovered. She ended up seriously psychotic with no memory of that time. Had she experienced it even 2 years earlier, she would have landed in a psychiatric ward for the remainder of her life. Anti-NMDA-Receptor Autoimmune Encephalitis! What a very long name. Dr. Josep Dalmau published his first research paper on this condition in 2007. 2 years later Cahalan became the 217th person to be identified. In this book she shares what she remembers of the distorted time leading up to her moment of crisis - hallucinations, paranoia, a fixation on apples - and then has tried to recreate her time in the hospital from interviews with family and medical staff, a journal kept by her parents and video footage of her on the epilepsy ward where she landed. 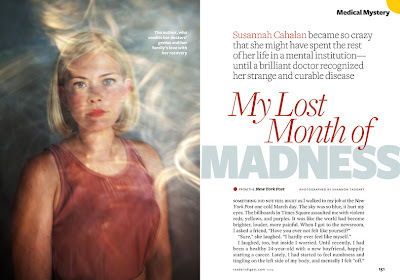 By the time they finally had this definitive diagnosis, she was descending into catatonia and was unrecognizable from the person she had been up to this time. Recovery was a very long, slow process and it was over a year before she began to feel like she was back in her own body, responding in a way that was in line with who she had been before. Memories of that month are gone and most likely will never return, a frightening concept for most of us. There is also a 20% chance of recurrence. Calahan again and again mentions how fortunate she feels to not only have been properly diagnosed, but to have made a full recovery. This is such a new condition that most doctors have still not heard of it - including the original neurologist (he had insisted she was an alcoholic) whom she called after the publication of her article. A study of 100 cases reviewed in The Lancet - a medical journal - published the following statistics. 91 were women. 58 had a tumor (usually an ovarian teratoma). Those with a tumor had a better higher chance of recovery. All had psychiatric symptoms or memory problems. 76 had seizures. 88 developed decreased consciousness. 86 had movement disorders. 69 had autonomic nervous system instability. 66 had breathing difficulties. Those with tumours had a better prognosis - no one know why. 75 recovered without residual problems and 25 died or had permanent severe mental deficits. ONE IN FOUR EITHER DIE OR NEVER RECOVERED! is a very powerful one for me. This is one book that will be staying on my shelf for awhile so that I can read it again. It not only is well-written, but brings home how little it takes for our brain to malfunction and what that experience might be like. I think the other question that arose for me is how many out there have been misdiagnosed with mental illness when the real problem is an auto immune reaction. Hopefully continuing research will help to improve the chances of those afflicted with this silent menace.